Make this valentine’s day memorable with a cute, delicious red velvet dessert. Armed with my heart shaped cookie cutter, I decided to make mini cakes instead of cookies for this year’s celebration. However it’s always a challenge to make a Vegan and healthy cake. The texture is achieved by tofu and colour by beet puree. I used Coconut milk almond frosting, where there is a magical taste of coconut and grainy texture of almond. Pre-heat the oven at 170deg C (fan assisted oven). Lightly grease two 9” round cake pans and set aside. Now in a blender, process the tofu, beet puree until creamy. Add agave nectar, oil, vanilla essence, milk and continue to process until smooth and combined. Once baked allow the cakes to cool in the pans for about 5-10minutes on a cooling rack before removing from the pans. Once cakes are completely cool and do the frosting. In a medium sauce pan, heat coconut milk, fruit sugar and simmer for 4-5 minutes. Remove pot from heat and very gradually blend in cardamom powder, desiccated coconut and allow pot to cool for 5-10 minutes. Feel free to substitute fruit sugar with regular sugar/coconut sugar/brown sugar. 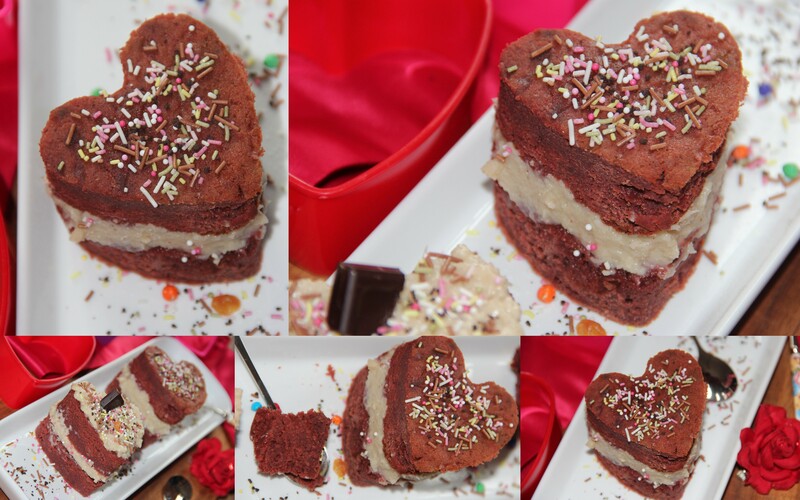 Posted on February 14, 2015, in Dessert, International, Vegan and tagged Healthy Velvet cake, Red Velvet cake, Valentines day cake, Vegan Velvet Cake. Bookmark the permalink. 34 Comments. I love these! So pretty, and I love that you used natural coloring. It’s a great blessing to have your support.. Thank you dear…happy belated Valentine’s day. ..
so cute! And I love that it contains tofu. This is awesome, Chitra.